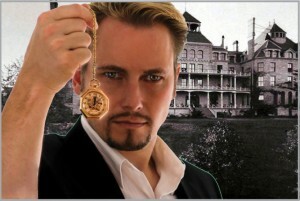 Special Intrigue Performance & Halloween Night Seance at America’s Most Haunted Hotel! 2nd Annual Halloween Séance at the Crescent Hotel presented by Intrigue Theater’s Sean-Paul and Juliana Fay. Once again they will try to reach across to “the other side” but instead of Houdini, this year’s target will be a former guest, patient and/or student utilizing artifacts from the hotel’s colorful 127-year history. The evening will also feature some grand new experiments seen for the first time that evening: hypnosis and mind reading performed on members of the audience. Click here for Tickets to this Exclusive Event! What the Spirit of Harry Houdini revealed to Eureka Springs. Last year Intrigue Theater and the America’s Most Haunted Hotel produced a series of events to celebrate the Spirit of Harry Houdini. It began when Sean-Paul the Illusionist re-enacted one of Houdini’s most famous escapes – He hung upside down in a straight jacket from the roof of the Crescent hotel. Two weeks later he was handcuffed and crammed into a 65 gallon galvanized steel milk can that was filled with water. In less than 2 minutes he had freed himself, but in reality it was a very close call. Harry Houdini died on Halloween in 1926 – but before he died – he promised his wife Bess – if he could – he would give her a sign from the other side. Every year since Houdini’s death – all across the country -magicians and fans of the escape artist have gathered on Halloween night – to see if Harry would make good on his promise. Last year, Sean-Paul’s’ Two Houdini Style stunts helped set the stage for the big event on Halloween Night. Sean-Paul and his INTRIGUING partner – Juliana Fay – conducted a Houdini Séance in the Crystal Ballroom of Crescent – America’s most Haunted Hotel. They believed that the Crescent Hotel would be as good a place as any to get a response from Harry. “Harry was a no show”, says Sean-Paul, “but we did get a response of some kind, regarding the number 218″ immediately when the number 218 was revealed on a chalk board – people in the room jumped up and believed that it was a sign not from Houdini but from Michael a worker that helped build the Crescent but fell to his death in what became room 218. This year the Crescent has invited Sean-Paul and Juliana Fay back on Halloween night for another attempt. This time Harry will not be the target but rather the residence of the Crescent. This year will be especially interesting as this is the year the Crescent has worked very hard to restore the old morgue in the basement and in doing so has found some artifacts that might be useful during a séance. The items include several room keys that date back to the first time the building was used as a Hotel, as well as a front desk bell. Also to be featured on Halloween night is a funeral Log (from the Cancer Hospital era) which will be brought to the event on Halloween night. No-one, including Sean-Paul and Juliane will be able to see it before that time. The evening will also feature some brand new experiments to Intrigue Theater and will be seen for the first time that evening. Sean-Paul will really push the human potential with some incredible hypnosis performed on members of the audience. Juliana Fay has recently tried to break through to see furthur into the minds of those in the audience. Finally, the biggest problem of the event last Halloween was that the room was packed and it was difficult for many people to see. This year to keep that from happening again the Crescent is doing two things: first there will be a smaller number of tickets sold to the event, and when it sells out – there will be no more tickets sold. Also – the room will be structured differently so that everyone will be closer to the activity. Regardless of what happens on Oct 31st – it is hard to imagine a more perfect way to spend Halloween night than a Intrigue Theater séance at America’s most Haunted Hotel. Throughout the decades, members of Historic Hotels of America have celebrated re-openings of such hotel facilities as their restaurant, lounge, spa, etc., but only one HHA member has ever made plans to re-open their “morgue”. 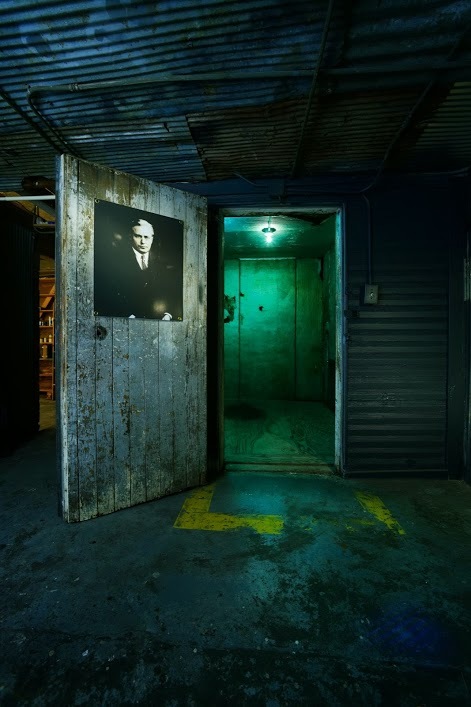 Now, just in time for Halloween, the 1886 Crescent Hotel and Spa, located in Eureka Springs, Arkansas, will celebrate the re-opening of its “morgue” throughout the month of October.